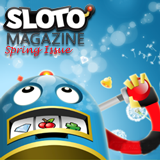 The Spring issue of Sloto Magazine is on the way to Sloto’Cash Casino players all over the world next week. As always, it features a three month calendar of casino bonus offers and hundreds of dollars in free spins coupons. This month there's also feature articles like “Excel in Blackjack – A Basic Strategy to Beat the Casino”, “How to Make Easter Rainbow Eggs”and a short history of St. Patrick’s Day. The Promotions calendar is a comprehensive listing of free chips, free spins and up to 310% deposit bonuses available at Sloto’Cash this spring. Chapter 4 in the Life and Adventures of Mr. Sloto was co-written by Sloto’Cash player Louis Pisano. In this instalment, Mr Sloto travels through time in search of ideas for new slot games. If you have a story idea for next time, submit it to contest@slotomagazine.com. If your idea is used, you'll win 200 free spins. Spring issue includes feature articles on Blackjack and a review of the new Nova 7s slot game. If you can find all 18 words hidden in the Easter Word Puzzle you'll win 50 free spins on the Hen House slot game. If you're registered at Sloto'Cash Casino, your copy of the magazine is on the way. If not, register at the casino today to receive your free copy.